In my previous post I talked about two significant successes for the Soviet Union in 1957: the first artificial satellite in orbit in October and the first living creature, a dog named Laika, in orbit in November. 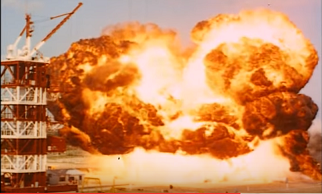 In December of that year the Americans had a humiliating failure when the Vanguard spacecraft exploded in a massive fireball on the launch pad. To boost American prestige and to show the American public that the US wasn’t falling further behind the Soviets, it was important that America get a satellite into orbit as soon as possible. They achieved this when Explorer 1 went into orbit on 1 February 1958. 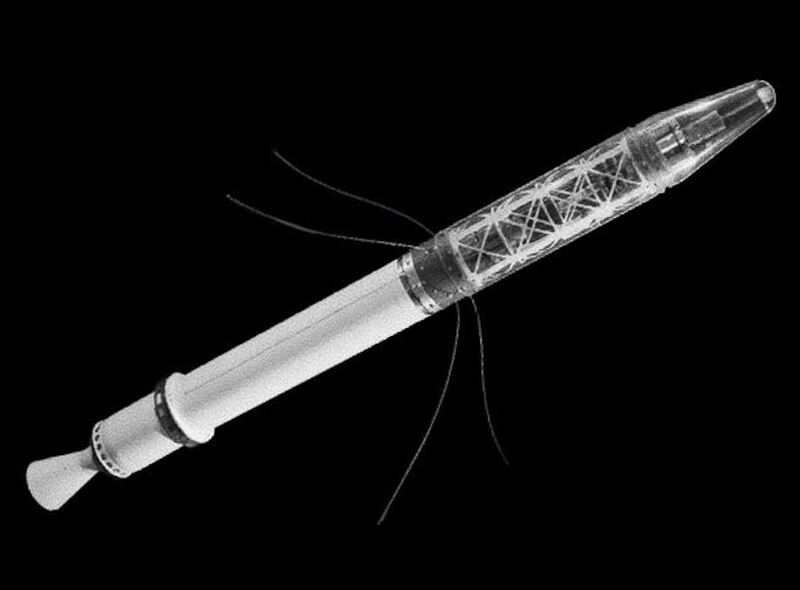 Explorer 1 had a payload of numerous science instruments designed under the direction of James Van Allen (1914-2006), a space scientist at the University of Iowa. It made the discovery that the Earth is surrounded by a belt of electrically charged particles trapped in its magnetic field. The radiation in these belts is so intense that the readings from the Geiger counter on the spacecraft went off the scale when it passed through them. The belts are invisible to telescopes on Earth which is why they had not been detected previously. 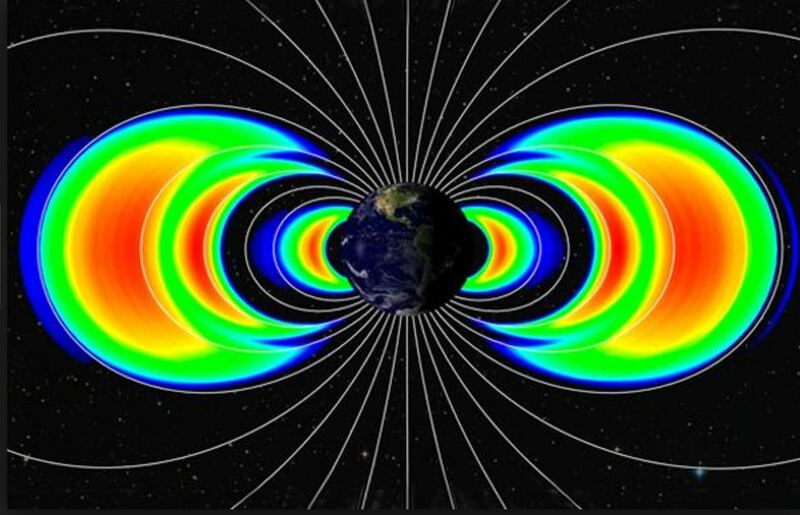 Today, in honour of Van Allen, they are known as the Van Allen radiation belts. Explorer 1, like the Soviet Sputnik 1 and 2 spacecraft, had no solar cells to generate its own electricity. Electrical power came from a non-rechargeable battery. Three and a half months after launch, the battery ran out of charge so the spacecraft couldn’t transmit or receive signals and its instruments stopped working. 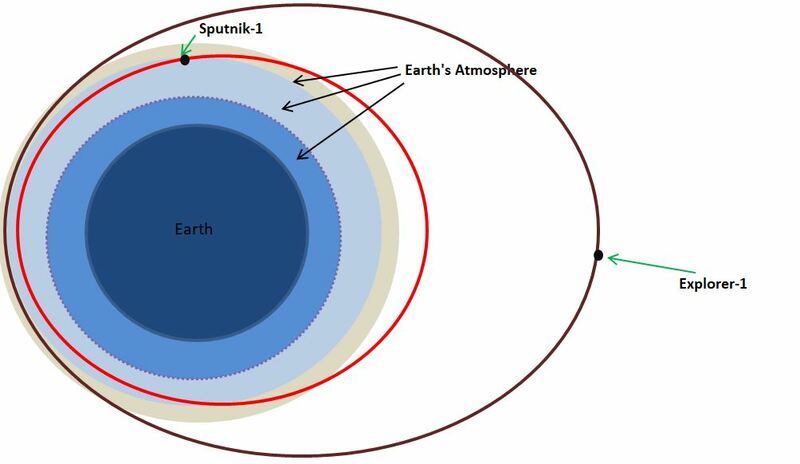 However, Explorer 1 continued to orbit the Earth as a ‘dead’ satellite for much longer than Sputnik 1 or 2, for reasons which can be seen in the diagram below. As shown above, Explorer 1 was placed in a much higher orbit than Sputnik 1 and 2. At its closest approach it was 358 km above the surface of the Earth and its furthest 2,550 km. The higher a spacecraft’s orbit, the longer it remains in space because the traces of atmosphere which slow it down by friction are much less. Therefore, even though it couldn’t transmit any signals back to Earth, Explorer 1 remained in orbit until March 1970. This was over 12 years after its initial launch, whereas the Sputniks survived in space for around 4 months. After the success of Explorer 1, the Americans successfully launched 4 other spacecraft into orbit in 1958. However, there were also 18 launch failures, meaning that nearly 80% of American launches in 1958 failed to get into orbit. Despite the American successes in 1958, the next big advances in space exploration were all made in 1959 by the Soviet Union. In January 1959 the Soviets launched Luna 1. This was the first ever spacecraft to reach escape velocity, a speed high enough to enable it to escape from the Earth’s gravity altogether. It flew 6,000 km above the Moon’s surface and during its journey provided direct measurement of the solar wind, a stream of electrically charged particles coming from the Sun. Luna 1 didn’t have a camera, so was unable to send back any pictures of the Moon, but its instruments made the discovery that, unlike the Earth, the Moon has no magnetic field. Interestingly, Luna 1 was actually intended to hit the Moon’s surface but it missed its target due to a navigational error (Zak 2016) so, after passing the Moon, it went into orbit around the Sun, where it remains to this day. Luna 2 was launched in September 1959 and this time succeeded in crash landing onto the Moon, becoming the first ever spacecraft to land on another celestial body. This again was a massive propaganda coup for the Soviets. It even boosted the reputation of the Communist system as a whole, according to some writers of the day: only a successful and thriving country could achieve such great scientific feats. Although their system couldn’t deliver the same level of material wealth for its citizens as free market capitalism, in 1959 the Soviets were ahead of America in space technology. It would not be until 1964 that America would successfully crash land a spacecraft on the Moon (see notes). Even more exciting, however, was Luna 3. 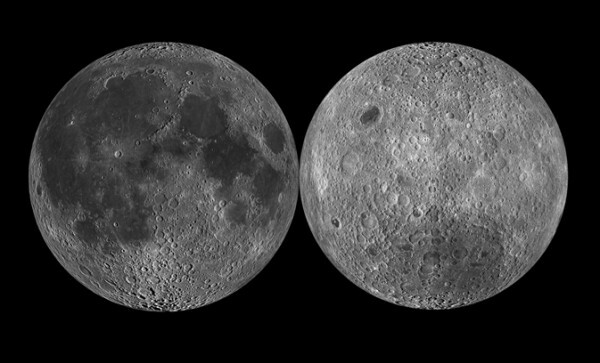 In October of the same year it became the first ever spacecraft to take pictures of the far side of the Moon, which had never before been seen from Earth and had remained an enigma throughout history. Luna 3’s images caused immense excitement around the world. These and subsequent pictures showed that the far side looks very different from the near side. It has a battered, heavily cratered appearance with a relatively small portion of its surface covered by the smooth dark areas (known as seas, or the Latin word maria). 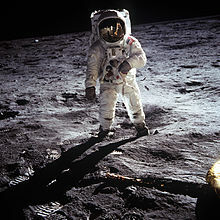 The greatest leap of all in the early days of space exploration came 18 months later. 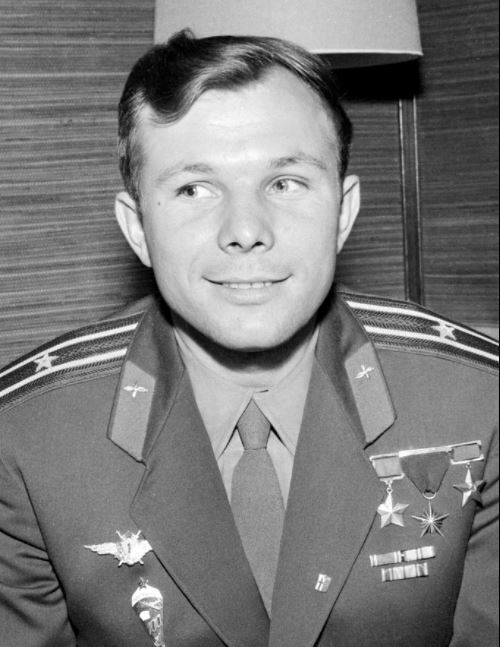 On 21 April 1961, a Vostok spacecraft containing cosmonaut Yuri Gagarin (1934-1968) launched successfully, performed a single orbit of the Earth, and safely landed 108 minutes later. This was a massive propaganda triumph for the Soviet Union and Gagarin, an air force pilot, became instantly famous throughout the world. 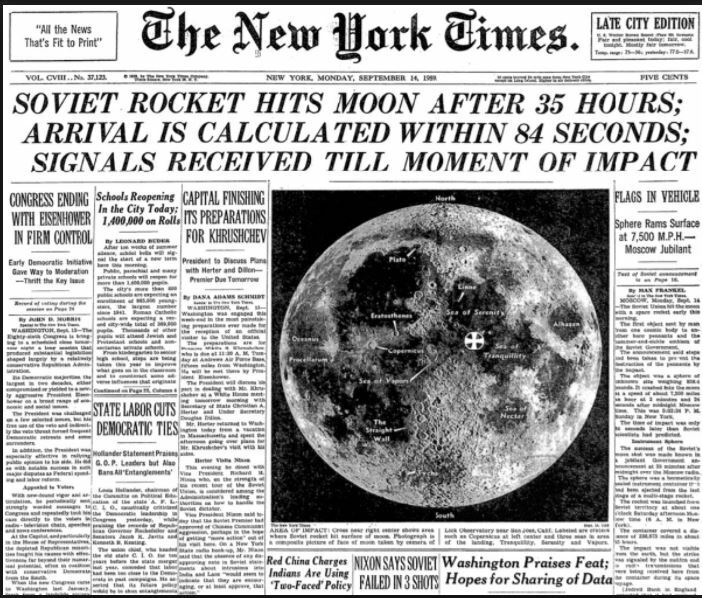 This was an incredibly ambitious goal, given that in May 1961 America had not yet even placed a man in orbit. 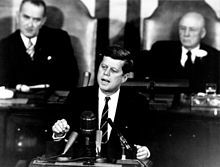 Nevertheless, Kennedy was advised that, given sufficient investment by the richest country in the world, a manned landing could be achieved before 1970. There was a good chance that the Soviets simply would not have the money to develop the new spacecraft and technologies required for this incredible leap forward. So, the American government funded the largest commitment every undertaken by a nation in peacetime. At its peak the programme employed nearly half a million people and its total cost in today’s money was around $180 billion. The Americans had won the space race. Actually, this is not strictly true. Ranger 4 crashed on the far side of the Moon in April 1962, thus becoming the first American spacecraft to land on another celestial body. However, due a computer malfunction, it returned no scientific data. The first American probe to land successfully at its planned landing site and send data was Ranger 7 in July 1964. Zak, A (2016) USSR launches the first artificial planet. Available at: http://www.russianspaceweb.com/luna1.html (Accessed: 30 September 2017). For a couple of reasons I ‘ll never forget the date of the 27th of January. One reason is the Apollo 1 disaster on the 27th of January 1967, causing the death of Virgil Grissom, Ed White and Roger Chaffee. Thanks for talking about James Van Allen. He is a favorite son of this area. His career was long and fruitful. He taught many young scientists about astrophysics. I met him once with my son to have him sign a book after he gave a talk. The U of Iowa still has a lot of involvement in space exploration. He was a truly great scientist. You are very lucky to have met him. Very nice post! There’s a lot here I didn’t know about, especially with the Vanguard and Explorer 1 spacecraft. Hello! You gave a review of mine a like and you are my first ever like! So I moseyed on over here only to discover that you have a wonderful site and that I am very much enjoying. 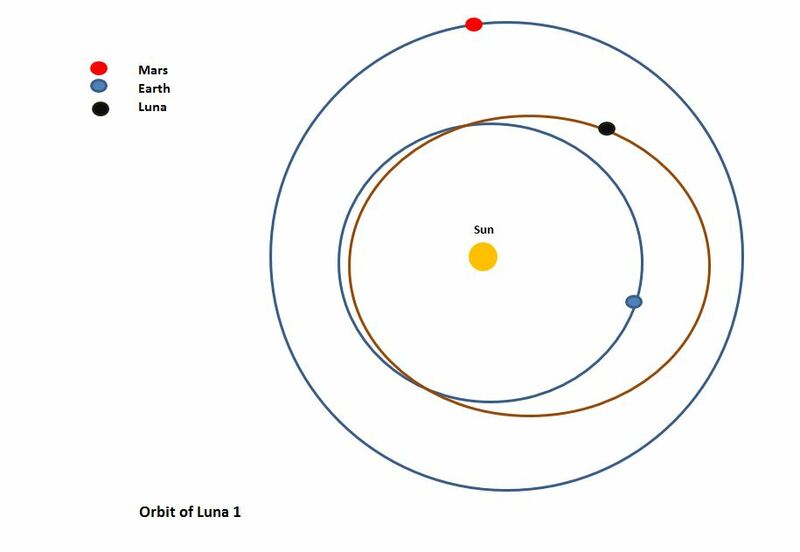 I don’t know much about rocket science but in the diagram depicting Luna 1’s orbit, I can see that it crosses with Earths, twice. Will it ever come crashing into us? Are the chances of that infinitesimally small or calculated to happen in an amount of years that make it relatively irrelevant (like a million)? Or would Luna 1 actually just end up in Earths orbit as soon as it entered our gravitational pull? Thank you for your comment and glad you’re enjoying my blog.